Eat sukiyaki at Susukino Yokocho. 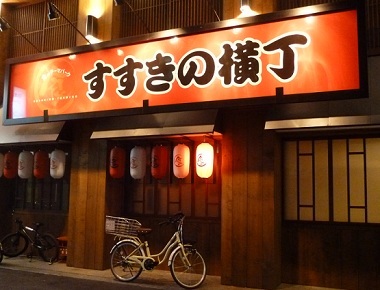 Don’t get this place confused with the Susukino Ramen Yokocho (ramen alley) because this building does not serve ramen. This building is conveniently located along the main road, Sapporo Ekimae Dori, in the heart of the entertainment district of Susukino. It’s down a side alley so keep your eyes peeled. Sukiyaki, if you didn’t already know, is a dish where raw thin strips of beef or pork are dipped into a boiling broth (a variety of soup flavours are available depending on the restaurant) and “swished” around until cooked. It doesn’t even have to be completely cooked as the meat is safe to eat raw, but not recommended for health reasons, so don’t worry too much if the meat is not completely cooked. 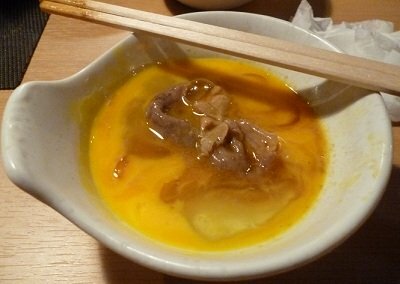 When you think the meat is ready it is then dipped into a bowl of raw egg before eating. Yum! It gets pretty heavy after a while and the taste is the same…..eggy and meaty, but sometimes I just crave it. To a lot of people outside of Japan, eating raw egg doesn’t sound very appetising. I know that’s how I felt before I came to Japan, but it is really good. The Japanese like to eat raw egg with a lot of things such as mixing it with rice for breakfast in the morning. I haven’t tried that yet, but I wouldn’t say no. Susukino Yokocho has many small restaurants that I feel are more similar to hawker street stalls you can find in other Asian countries such as Hong Kong, South Korea, Malaysia, etc. 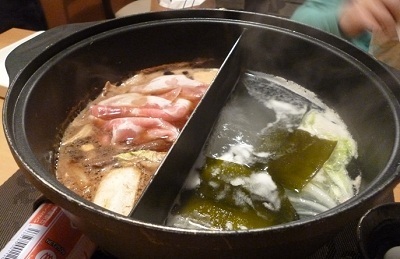 Apart from sukiyaki you can also find Shabu shabu, Nabe, Jingisukan. Most of the places offer at least one or two of these dishes and the prices are very reasonable. 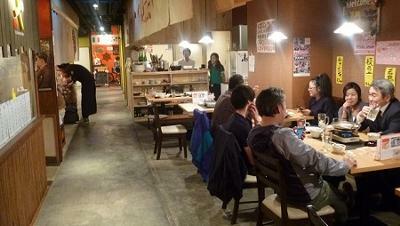 The cost for all you can eat sukiyaki and all you can drink (“Real” beer is not included. If you want to drink “real” beer you have to pay an extra 200 yen) was less than 2000 yen each. Cheap as chips for a traditional Japanese dish that you shouldn’t miss. If you are confused as to what “real” beer is and what the alternative to it is I’ll let you know. Around about 2007 or 2008 Japan created a new kind of cheaper beer brewed with different kinds of ingredients and they named it Haposhu. Some people nicknamed it “fake beer”. The taste is almost exactly the same as regular beer but has a bit of bad aftertaste and most people can tell the difference. However, recently the beer companies are getting better at producing Haposhu and the difference in taste is hardly recognisable. Heck, I’ve even started drinking it. Most Japanese love it and tend to drink it at home after work every day. Yep, one Haposhu a day.